My little niece can’t seem to catch a break this year, going from pneumonia, to now a flu, or possible food poisoning, yet through it all, she’s a chipper little girl, who takes more responsibility and shows more maturity than most. My niece being sick brought this story to mind. In 1970, I began my edumacation at Balbo Elementary in Shoal Harbour, and I was a sickly child, tiny, pale, undersized (I was 4’2″ at the start of Grade 8, for reference, my niece is that now in Grade 1). Dr. O’Mahony used to say to mom, some puny isn’t he? 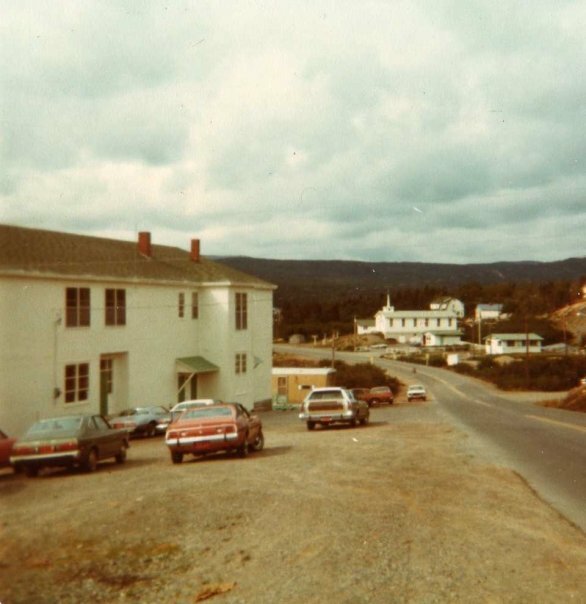 Many days were spent in Neta Pelly’s trailor (seen in the picture just past the school), my kindergarten teacher, while waiting for Dad to come get me. The school was this huge or at least huge to me building full of stairs, rooms, and hallways and the usual school things. I don’t remember a huge amount about it other than Hughie Reid and I playing on the stairs, and chasing Sharon Adams around (who I wouldn’t know today if she bit me, though I hope she doesn’t). My best friends back then were Danny Moodie (Moody?) and Gregory Steele, both of whom I also hope don’t bite me. I was neither responsible nor mature when I was 6 or 7, (well probably not mature even now), and this lack of responsibility is at the heart of this story. Gregory Steele invited me to his birthday party in Grade 2, which would have made me 7 at the time. Somehow I forgot to admit this fact to my parents, or to get a gift, or to do anything one normally does for a party. Likely I forgot all of the above, but I do remember clearly Gregory asking me the day of if I was coming. I responded that I had no gift and so couldn’t come. He replied that didn’t matter and that he wanted me to come anyway. Well with that, I was off. After school I made my way to his place (I don’t remember how) and enjoyed cake and games. My brother, who usually met me at the bus in the evenings didn’t think much of me not being there as I often was sick as noted, and Dad came and got me. The party was located somewhere back up in Shoal Harbour, closer to home than the school, near where Bruce’s Marine is, or was. Once I was done with the party, I decided it was time to leave, and with no more thought than that, I left, and started walking to where Dad worked. Dad was working with the Department of Highways as a clerk at Shoal Harbour pit, a location where they used to make concrete pipes, and located approximately where the Shoal Harbour Softball field is now. So I, a puny little runt, proceeded to walk, at age 7, the approximately 2 miles to Dad’s work. I couldn’t have stayed at the party too long, because just Mom found out I wasn’t with my brother, (the bus ride took perhaps an hour or more), and called Dad in a panic, and Dad got up to leave to come look for me, there he sees me strolling into the pipe yard as unconcerned about my absence as if it was a normal thing to do. I really don’t recall if I was punished, or if they were too relieved to even think of that, but I’m sure I did get a yelling at least. In any event, I guess I grew out of my sickliness, even if I didn’t mature. Its ok, makes me one more big toy for my niece to play with. Get better soon sweetie.